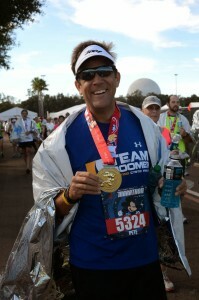 Even without a race recap, many of you – my dozen or so readers – already know that just a few nights ago, I completed my first half marathon down in Orlando at Disney’s Wine & Dine Half Marathon. And while I am proud as punch that I, a formerly obese smoker, was able to run 13.1 miles in just a little over two-and-a half hours, I really want this post to be about a few people who are much more inspiring than I’ll ever be. Yes, I’ve lost 100 pounds; yes, as of Monday, I have been smoke-free for two years; and yes, and even though I’m a lot slower than I was twenty-five years ago, I have regained some of my running mojo and have put myself on that proverbial path to my first full marathon in January. …I had some time to think as I made my way through the crowds, and I was reminded of a new Facebook / Team Boomer friend of mine: Steve Bell. As many of you know, I am running for Team Boomer, which is the athletic fundraising side of the Boomer Esiason Foundation to fight and find a cure for Cystic Fibrosis, which is primarily a lung disease against which my niece and nephew have fought their entire lives. Well, Steve battles the same illness, and sometimes he does so fiercely. I was reminded of Steve because ha had run the New York City Marathon just a week earlier, and although he was disappointed with his performance, the last two sentences of his blog post certainly tell us who he is: Another New York City marathon under my belt. Another great day of celebrating life. Steve – You are a hero and an inspiration, and I look forward to running “your” race – the New York City Marathon – with you in the years to come! It’s a good thing I’m not presenting this blog post to my dozen or so followers in person. I’ve already teared up a few times while writing about Steve, and I don’t think I’d be able to get through telling you how my niece Anna was also there with me in spirit (and purely unintentionally) as I prepared for the race. Standing in a sea of people, I just stared at the post for a few minutes before I tried (unsuccessfully) to respond…because of the whole 4G thing. It wasn’t until a day or two later that I thanked Anna for reminding why I was wearing a Team Boomer shirt. Anna – You are a hero and an inspiration, and my sincere promise to you, to Aidan, to Steve, and to everybody battling Cystic Fibrosis is that I will continue to run races to raise money to help find a cure for Cystic Fibrosis. And, no, Anna…it’s not so much to ask for.